Ajanta Cave Temple is the marvelous architectural wonder that depicts the rich legacy of India. Acknowledged as the world heritage site, Ajanta Caves are renowned throughout the Globe. Located near Aurangabad, Ajanta Cave Temple can be reached easily from anywhere in Maharashtra by means of regular tourist buses or by hiring taxis. The nearest airport is located at Aurangabad that lies at a distance of 99 kms from the temples. The charisma, of these caves, attracts millions of visitors each and every year. 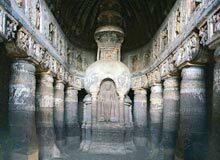 In the early 19th century, the long buried Ajanta Caves were discovered unknowingly by a British Army Officer. At this juncture, the beautiful sculpted caves that were lying deep within the Sahyadri Hills, above the Waghora River, came into the sight. The cave temples are sited in a horse-shoe shaped cliff, where Wagura is flowing at the bottom. Wagura River falls from a height of 200 feet, consequently making a series of waterfalls. The thud of these waterfalls can be easily noticed in the Caves. Cut out of rocks, Ajanta Caves trace their origin between 2nd century BC and 6th century AD. Ajanta Cave Temples are dedicated to Lord Buddha. Not less than 30 in number, these caves used to make the lodging of followers and students of Buddhism. During the time of their stay, they adorned the caves with their outstanding architectural skills and artistic paintings. Generally, the carvings and the paintings illustrate the life stories of Lord Buddha. In conjunction with this, numerous styles of human and animal figures are also engraved in the rocks. The pictorial carvings and murals at Ajanta depict the modern society of those times. The artistic sculptures presented every kind of populace from kings to slaves, from men to women, from children to beasts along with flowers plants, fruits and birds. There are some figures that portray the inhabitants like 'Yakshas', 'Kinneras' (half human and half bird), 'Gandharvas' (divine musicians) and 'Apsaras' (heavenly dancers). All the thirty caves are divided into 'Chaitya-Grihas' (stupa halls) and 'Viharas' (dwelling halls). In order to reach each cave, one has to flight of steps that are preserved in their original structure. The Cave 9, 10, 19, 26 and 29 are known as 'Chaitya-Grihas', which were used for the worship of the Lord. The remaining caves are 'Sangharamas' or 'Viharas' that were used for the housing purpose of the followers and students of Buddhism. The caves are numbered as per their present access from the main entrance and were not erected in the same order. From artistic point of view, Cave 1, 2, 16 and 17 are really important and possess remarkable pieces of art that can certainly beat art of the modern world. The walls of these caves are adorned with murals that are maintained to provide the same charm and vibrancy of the bygone era. The wall paintings of the caves are made with the Tempera technique. This technique involves painting on a dry surface, after the wall is coated with 1 cm thick layer of a mixture made of clay, cow dung and rice husks. The painting is coated with a coat of lime on completion. In those times, the colors used to be natural. As per the facts revealed by Archeological department, the caves were carved out in two different segments, with a gap of more or less four centuries. The caves made in the first segment, date back to 2nd century BC whereas the caves of the second segment are said to have been made by the Vakatakas and the Guptas. Each cave comprises carvings and paintings representing the incidents of Buddha's life, Bodhisattvas and the Jatakas.